Meanderthals is the illegitimate brainchild of Tom Manche, a songwriter-guitarist-singer-producer-engineer-Nashvillian who is fond of hyphens. The debut CD release, Tom Manche & the Meanderthals, contains 13 songs which, although happily meandering through a number of diverse musical styles, all share the same, shall we say, skewed outlook. Take, for example, Magic 8 Ball, a Memphis-style R&B groove which speculates that the president might be consulting a certain plastic toy to make major policy decisions. Or Hck-Tzhzh, ...that would be the taunting whipcrack sound guys make to one of their own suspected of being P-whipped, set to a hyperdrive country rave-up. Morning Breath professes by way of a slinky bossa nova beat that ones love can withstand the strain of any mere a.m. halitosis. How about Snookums, a cool hipster-esque track exposing the little-known aphrodisiac qualities of babytalk. Or Bad Dancer, an account of undoubtedly the worlds worst hoofer. ...like a chimp on acid gone berserk, or a rusty robot all herky-jerk... sure to make you feel less self-concious about your own pathetic dance moves. Some of Music Citys finest players lent their considerable talents to the project, including a cameo by dobro ace Jerry Douglas. Theres not a sappy love song, angry urban tirade, or ultra-sincere ode to nature in the bunch, but no matter what your age, taste, or shoe size, theres guaranteed to be something to tickle, tweak, tantalize, or torture in this collection. Tom Manche & the Meanderthals costs $10.95 (free shipping). 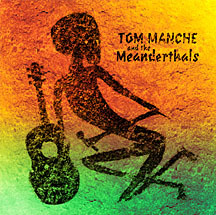 Download Tom Manche & the Meanderthals at iTunes. Click here for other ordering options.